Miscreants. Street urchins. Drug addicts. Criminals. Thugs. Prostitutes. These are examples of the negative adjectives commonly used to describe young people living in urban slums and informal settlements. Labeling them in this manner often provides justification for security agents to routinely raid the spaces and places where they live, leading to the arrest and detention of many. Some of them are languishing in jail without a fair trial. They are predominantly poor and lack access to the formal justice systems. To make matters worse, their efforts in seeking justice are usually downplayed by the authorities. As a result of these negative labels and adverse impacts on them, they are regularly denied access to social and economic benefits and opportunities that young citizens are ordinarily entitled to. Dr. Monique Morris, Founder, National Black Women’s Justice Institute is one of the leading advocates campaigning against the criminalisation of poor, young people. She is the author of Pushout: The Criminalization of Black Girls in Schools. The book discusses the experiences of Black girls in the United States whose intricate lives are misunderstood, highly judged–by teachers, administrators, and the justice system–and degraded by the very institutions charged with helping them flourish. It shows how, despite obstables, stigmas, stereotypes, and despair, Black girls still find ways to breathe remarkable dignity into their lives in classrooms, juvenile facilities, and beyond. The experiences of Black girls in the United State are strikingly similar to the realities of young people living in Lagos slums. Dr. Morris made this finding when she visited Nigeria in January 2018. At a one-day youth interactive session SPACES FOR CHANGE organized on January 25, 2018, Morris met with over 30 slum youth from Badia-East, Otto-Ilogbo, Otumara, Ifeoluwa, and other informal communities in the Lagos Mainland area. The personal stories told and the numerous experiences shared helped to draw out the striking similarities between the black youth in the United States and the young people living in the urban slums of Lagos. For instance, Dr. Morris described how authorities in the United States turn away boys and girls from schools because of behavioural issues like alcoholism, drug addiction and so forth. Because little attention is paid to understanding the reasons behind their conduct, corrective actions and opportunities that will facilitate behavioral changes are missed. As a result, hopes are dashed while the future looks bleak for young, poor blacks. In the Lagos slums, a number of factors dash the hopes and dreams of young people, preventing them from reaching their potentials. Sharing her own story, Adeola Oreotan, a 20-year old also stated that she lost her mother in 2015 which halted her plans to gain further education. Adeola’s dream is to graduate from the university, get a good job, and contribute positively to society. Kehinde Ilawole is an artist. In his words, “I dream of becoming a great legend like Leonardo Da Vinci”. His friend, Biodun Ayinde, wants to be a football legend. Moses Anjola, 24, shared a story about a demolition exercise in his community. The Lagos State Government ordered the demolition without any compensation or plan for relocation, which led to lack of resources for him to go to school and get an education. He is passionate about going to school just like every other young person. Despite the dashed dreams, many of them have their personalized ideas of what an ideal community and future would look like for them. For Christiana Ovuefor, an ideal community is a mega-city designed for both the rich and the poor, and not just the rich alone. In her words, “a community should be accommodating to both the rich and the poor”. Moses Anjola believes an ideal community is one where people live together in peace, and with adequate resources to get educated. Adesanya Raphael sees a perfect community as one where the government adequately provides basic amenities such as potable water and electricity. These conversations show that young people living slums have tall aspirations like everyone else, and should be given opportunities to realize them. Dr. Morris’ next book will focus on the comparative experiences of the black youth living in the US and the slum youth in Nigeria’s urban centers. This is also consistent with S4C’s campaign to build a global narrative that challenges the marginalisation and criminalisation of poor people. 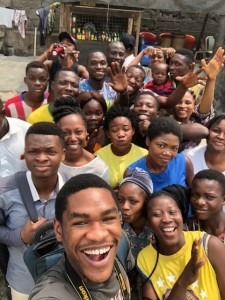 In 2017, S4C implemented the IFESOWAPO project which combined trans-media tools with a participatory action research (PAR) to build slumdwellers’ capacity to challenge and shift hegemonic narratives about the spaces they inhabit and slum dwellers. This shift became necessary to end their exclusion from urban planning, often leading to their forced displacement, as commonly witnessed in Lagos State. Determined to end the historical labeling and the linked negative repercussions, S4C continues to implement youth-focused projects within 10 informal communities in Lagos State. The programs mainly focus on equipping slum youth with the knowledge and skills on human rights, media production, leadership, film-making and digital story-telling. With their growing involvement of slum youth in these outreaches across Lagos informal communities, they seem to be saying with one voice: Enough! Stop criminalizing the youth living in the slums! Dr. Morris and SPACES FOR CHANGE are both grantees of the Ford Foundation.